Pauline Elisabeth Ottilie Luise zu Wied (Schloss Monrepos, Neuwied, 29 December 1843 - Curtea de Argeş or Bucharest, 2 November 1916) was the Queen Consort of King Carol I of the Romanians, widely known by her literary name of Carmen Sylva. She first met the future King of Romania at Berlin in 1861, and was married to him on 15 November 1869 in Neuwied. Their only child, a daughter, Maria, died in 1874 at age three. In the Russo-Turkish War of 1877-1878 she devoted herself to the care of the wounded, and founded the Order of Elizabeth (a gold cross on a blue ribbon) to reward distinguished service in such work. She fostered the higher education of women in Romania, and established societies for various charitable objects. Early distinguished by her excellence as a pianist, organist and singer, she also showed considerable ability in painting and illuminating; but a lively poetic imagination led her to the path of literature, and more especially to poetry, folk-lore and ballads. In addition to numerous original works she put into literary form many of the legends current among the Romanian peasantry. She was the 835th Dame of the Royal Order of Queen Maria Luisa. In 1881, due to the lack of heirs to the Romanian throne, King Carol I adopted his nephew, Ferdinand. Ferdinand, a complete stranger in his new home, started to get close to one of Elisabeth's ladies in waiting Elena Văcărescu. Elisabeth, very close to Elena herself, encouraged the romance, although she was perfectly aware of the fact that a marriage between the two was forbidden by the Romanian constitution. (According to the 1866 Constitution of Romania, the heir to the throne was not allowed to marry a Romanian). The result of this was the exile of both Elisabeth (in Neuwied) and Elena (in Paris), as well as a trip by Ferdinand through Europe in search of a suitable bride, whom he eventually found in Queen Victoria's granddaughter, Princess Marie of Edinburgh. 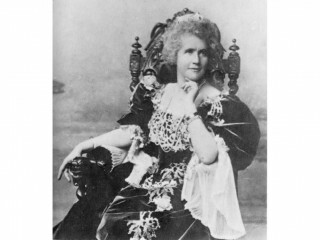 The affair helped reinforce Elisabeth's image as a dreamer and eccentric. View the full website biography of Elisabeth Of Wied.